One of the blessings in having Oaks Fellowship worship at our church on Sundays is getting the chance to get to know some wonderful people from another country and culture. Over the next few weeks, we will introduce you to some of our Oaks friends. Today, meet Gadi Samson. Gadi is the son of Pastor John Ronel. With four sisters and five brothers, he and one sister are in the middle. Born in the Democratic Republic of the Congo, Gadi moved with his family from Africa to Wisconsin when he was 8 years old. One of Gadi’s first memories of life in America involves snow. Picture their whole family in Wisconsin when suddenly “white stuff” started falling from the sky. After a while, though they were all still in their pj’s, they wanted to go investigate and went racing out to the back yard. They quickly went from excitement to “Oh my goodness!” and discovered that the white stuff was damp and very, very cold! That same year, Gadi became the proud owner of some purple snow pants that he just loved, partially because you couldn’t go out for recess without them. However, that too was a new learning experience. The class was going directly from recess to their Christmas concert. Gadi proudly wore his purple snow pants to recess, not knowing that all the other kids wore other clothes underneath for the concert. He still remembers wearing those precious purple snow pants to his dressy Christmas concert because he couldn’t change! Today you can find a very busy Gadi working at a full-time job with Aflac, taking online courses at DeVry University, and working on the enrollment process at WSU to add to his two years of college at the University of Wisconsin. He hopes to finish a degree in project management, and hopes to work in missions in various countries, using his construction background. 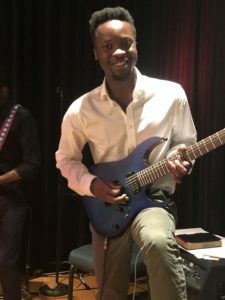 Gadi is also part of the Oaks worship team, using his gifts to play electric or acoustic guitar, piano and singing. Needless to say, Gadi loves music! Gadi even takes time to give back to Eastminster by working on Local Mission’s team RIOT (Refugee Immigrant Outreach Team). He speaks English and Swahili, and is working on Kinyarwanda, and even some Italian. If you really want a treat, head over to our Student Center 10:45 (or later!) any Sunday to watch this worship team in action and to worship with great joy alongside our Oaks friends.